Art Sites gallery is hosting the second annual Peconic River Day on Staurday June 19th from 1pm - 5pm . Come for boating on the Peconic River, children's activities, music jam, an art opening, a cook out and more. 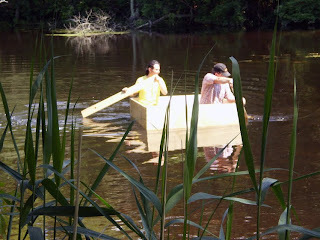 The following photos are from last year's boat launch at the first Peconic River Day. For more details see below! 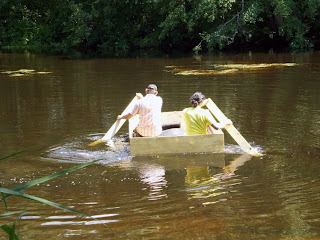 Photos - top to bottom - Jose Krapp and Ted McGurn testing Jose Krapp's art crate boat. Come join us for a day of boating on the river, recycled craft-making, art presentations, music jam, potluck meal and more in and beside the Peconic River at Art Sites Gallery in Riverhead! Bring your kayaks and canoes and paddle around the Peconic River. Share one with your neighbor or try out artists Bob Braine and Leslie Reed's plexi-bottomed canoe. Bring a dish or some goodies to share for a community picnic. An informal musicjJam will be held outdoors at Art Sites. If you have an instrument, be it drum, guitar, maracas, or some chopsticks, bring them along! Kids and parents can build a miniature cork boat using recycled objects. Test and race your boat throughout the day on the “tabletop riverway!” Keep your mini cork boat as a souvenir! Hosted by Brent Timbol. "Words in the Wind Along the River"
Roseline Koener and Patti Robinson will lead a workshop and flag-making from recycled materials. Create your own flag with words, signs and colors as an expression of gratitude to Mother Nature. We'll plant them along the riverbank in a colorful chorus beside the trees, flowers, and flowing water. Create a birdseed sculpture/feeder for our feathered friends! Take inspiration from Charles Butterly’s sculpture, "Which One is Pink?" on view. Guided by Andrea Cote. Bring your plastic bags and sticks! Abby Vakay from Hamptons Yoga Healing Arts will guide participants in flowing movement inspired by the river. Patti Robinson and Meryl Speigel will share their recent photography projects documenting people and places and along the Peconic River. Support Handmade Crafts: Crafts will be available by local artisans including Attoche's Link/ Breahna Arnold http://vimeo.com/7460063, CLART, Art for Living/Claudia Garavito, Purple Heart Candles/Carrie Ann Salvi, and global fair trade goods from the World Village Fair Trade Market! Chair massage by Toqui Terchun of Mobile Therapeutic Massage. A percentage of proceeds will benefit Peconic Green Growth. Peconic River Day is presented by Art Sites and Peconic Green Growth. Peconic Green Growth's mission is to promote the transformation of the Peconic River Corridor with artistic, cultural and ecological projects and events. PGG collaborates with local residents, community organizations, businesses and institutions to increase awareness and vibrancy of this beautiful natural resource. You can stay updated and view images of last year's event by visiting the Facebook Page: Peconic Green Growth/ PGG.